Dortmund are represented by three players in this week's XI. 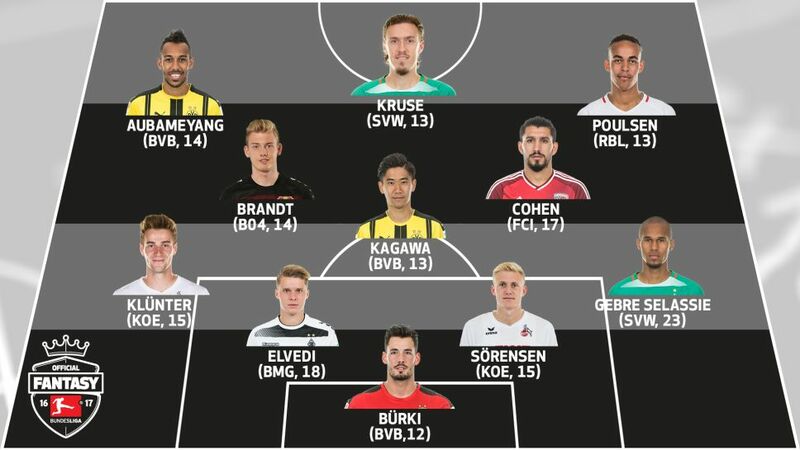 SV Werder Bremen’s Theodor Gebre Selassie was the highest Official Fantasy Bundesliga point-scorer on Matchday 27, but who else joined him in this week’s dream team? How did your Official Fantasy Bundesliga rank on Matchday 27? Click here to find out! Switzerland international Bürki was a calming presence for Borussia in their 3-0 win against Hamburg, saving all six efforts on his goal to keep an eighth clean sheet of the season. Kagawa picked a good time to score his first goal of the season against Hamburg on Tuesday. He also assisted the third goal for Pierre-Emerick Aubameyang and won the free-kick that led to Dortmund’s opener. With three assists in his last four matches, goalmania appears to be bringing the best out of the Japan international. Darmstadt must be sick of the sight of Brandt. He hadn’t scored since Leipzig at home in mid-December but, as has become his habit, he notched against Darmstadt for the third match in a row. Kudos if you picked him, and why not stick with him for Matchday 28? He’s due to face Leipzig again. Ingolstadt may be second from bottom but they will not be relegated without a fight, and Cohen appears to be leading their resistance. He scored twice in Wednesday’s crucial win at third-bottom FC Augsburg – he now has six for the season – and the goals were his first ever brace in professional football. Watch: Cohen reflects on Ingolstadt's huge win at Augsburg. The Gabon international is a points guarantee in Official Fantasy Bundesliga. He scored his 25th league goal of the season – equalling his tally from last term with some seven matches remaining – and assisted for Kagawa to double Dortmund’s lead against HSV. Like Kagawa, Kruse has also been on fire since the international break ended. Against Schalke he netted his 50th Bundesliga goal, and he provided the assist to make it 3-0. He now has a goal and an assist in each of his last two appearances, so you’d be silly to leave him out of your team for Frankfurt away on Matchday 28. Poulsen made the most of his first league start in two months, winning 15 challenges and laying on a goal in the 3-2 win at Mainz. Click here for the Matchday 27 round-up!